Today (5/2) only score guitar and/or piano beginner packs for over 50% off. The eMedia Guitar Beginner Pack is just $49.99 (Reg. 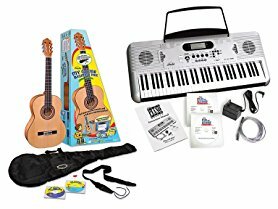 $119.95+) and the eMedia Music EK07105 Play Piano Pack Deluxe only $112.99 (Reg. $299.95)! This complete piano course lets you learn piano basics and master more advanced piano skills, plus you get a quality electronic keyboard you can play anywhere. So play piano today with the Play Piano Deluxe Pack! A 61-key, full-size, touch-sensitive electronic keyboard with built-in speakers, 300 realistic sampled sounds (including digital piano), reverb and chorus effects, sheet music stand, and headphone jack. USB/MIDI connection for interfacing with your computer. Piano course software with BOTH the eMedia Piano and Keyboard Method and eMedia Intermediate Piano Method piano software for a total of over 450 interactive lessons.